Now in it's third year, Southbank's Regional Flavours was a big hit with Brisbanites this weekend. The v. talented team from Gloss Creative put together the experiential areas including a fabulous fluoro wheelbarrow garden where visitors could pick 'n mix their preferred herb combination to make a hot tea infusion (I am off to buy a lemon verbena plant for my garden after sniffing that stunning aroma). Screen printed burlap bunting transformed 2 big-top tents into eye catching event spaces, and they were obviously the 'place to be'. Specialists in all manner of foodie topics talked to full houses at each session from what my little eye spied. Southbank do a great job with community events and I'd have to say the sheer number of artisan producers who gathered in the gardens was pretty impressive. Window washers at Evelina Children's Hospital in London must wear a superhero costume (it's written into their contract apparently). That's clever and right on brand. Spotted on Pinterest. The original Sprinkles store in Beverly Hills now dispenses their cupcakes 24/7. Select your favourite flavour, pay with your credit card and 'voila' your cupcake is delivered. Via the very joyful blog OhJoy! Le Nid gets 'le nod' for being 'le too funny'. Spotted on WeHeart's fab blog I am just going to re-post the exact words and pics as they sum it up beautifully. Dominating the skyline of Nantes, and one of France’s tallest buildings outside Paris, Tour Bretagne is not exactly the prettiest of skyscrapers – but that no longer matters. Not one iota. Because, thanks to London-based French graphic designer Jean Julien it now hosts perhaps one of the greatest sky bars on the whole bloody planet. 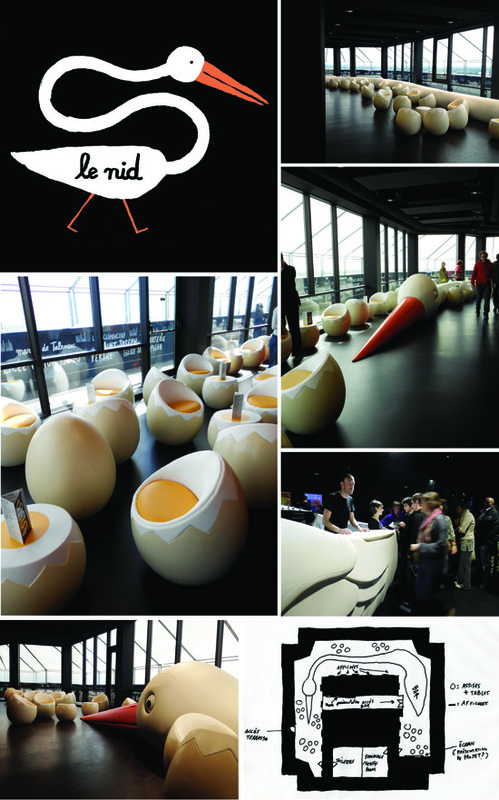 Le Nid – which towers 144m over the city – centres around a sleepy 40m-long half-stork, half-heron, and its eggs; which form the bar’s stools and tables. 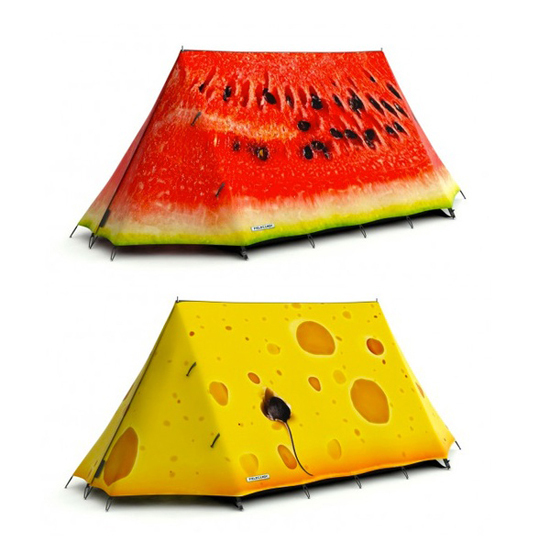 Couldn't resist re-posting these fabulous, colourful, clever, unexpected and limited edition tents from Field Candy. Made in the UK, these canvas creations are the result of creative collaborations with some big hitters on the world design stage. If you're going to Glastonbury, Badminton or Blenheim then I guess this is one way to find your camping spot in a sea of sameness. Via The Coolhunter. LV invest in VM. Love the gorgeous paper shirt campaign currently wowing around the globe. Repeat repeat repeat. Clever Calvin Klein windows. Spotted at Chadstone. These recent windows for Review were a show stopper. I felt like I could have been walking past Printemps in Paris or Selfridges in London. Nice work Myer.